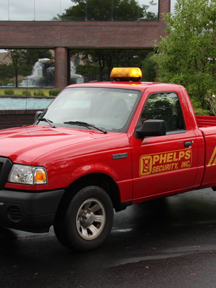 If there’s one thing that stands out about Phelps Security, it’s our familiar red trucks. We insist on red vehicles for our entire fleet, not only because optimal visibility is an effective deterrent, but also because we value consistency when it comes to our company’s identity and services. The mark of a team. We at Phelps believe teamwork, from our ownership down to every security officer, is the key to success. Our vehicles, always clean, well-maintained, and highly visible, are no different from the uniforms that distinguish every Phelps security officer. A security vehicle shouldn’t blend in to the crowd — just the opposite. Red Phelps Security trucks are a symbol that stand not only for safety and watchfulness, but also dedication, service, and quality.